The Government of the Republic of Korea has announced 2018 Korean Government Scholarship Program’ for undergraduate degree tenable at higher educational institutions in Korea. The guidelines, application form, selection process and programme policies for 2018 Korean Government Scholarship Program’ for undergraduate degree in annexed. 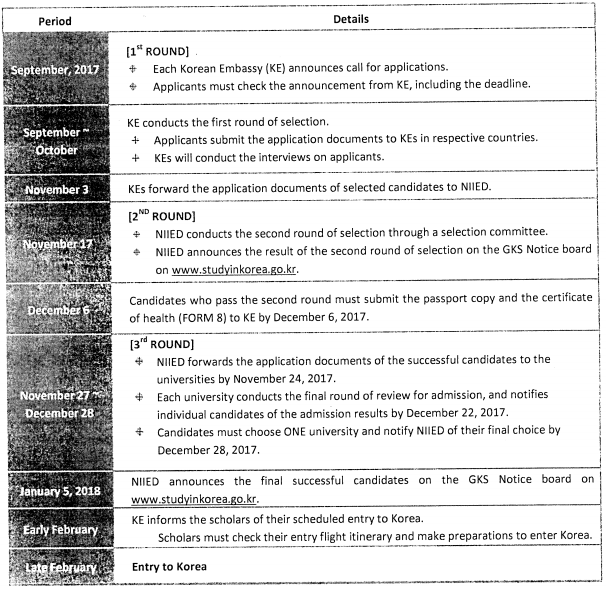 Further information and the MS Word life of the application may be obtained from the Embassy of the Republic of Kerea home page ind.mofa.go.kr or http://www.studyinkorea.gov.kr. The Korean Government Scholarship for undergraduate degrees is designed to provide international students with opportunities to study at higher educational institutions in Korea for Bachelor-level degrees, which in turn will contribute to promoting the international exchange in education and to deepening the mutual friendship among countries. Prospective applicants must meet all of the following conditions. 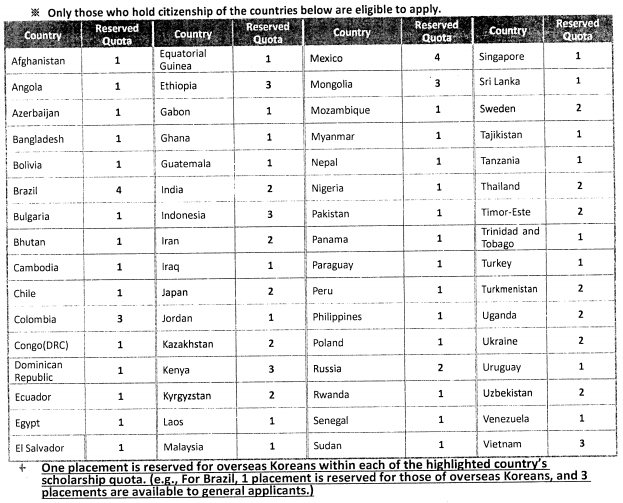 Citizenship: An applicant and his or her parents must be citizens of one the countries listed. Exception (Only for those holding Japanese Citizenship): Individuals whose parents hold a Special Permanent Residency Permit’ within Japan while holding Korean Citizenship may be deemed eligible to apply. Age: An applicant must be under age 25 as of March 1, 2018 (Should be born after March, 1, 1993). Health: An applicant must be in good health, both physically and mentally. Grades : An applicant must either have the cumulative grade point average (C.G.P.A) of 80% (out of 100%), or be ranked within the top 20% throughout the entire high school period. C.G.P.A should be 2.64/4.0, 2.80/4.3, 2.91/4.5, 3.23/5.0 or higher. If an applicant’s high school has an evaluation system different from the above scales. 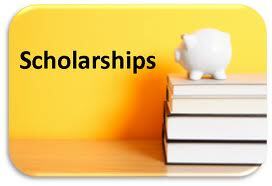 An Applicant should never have been awarded with scholarship programs from Korea for an undergraduate degree program. An applicant must have no limitation in travelling abroad. Applicants who have proficiency in the Korean or English language will be given preference. Descendants of the Korean War verterans will be given preference. Engineering and Science majors will be given preference. Applicants from how income families or underprivileged backgrounds will be given preference. Applicants who are confirmed to be ‘third generation’ overseas Koreans will be given preference. An applicant is restricted to apply either for the Embassy Track or for the Regional University Track. Applicants must choose up to 3 different universities and write their choice in the Forms. In choosing the preferred universities and majors, it is advisiable to contact the universities in advance for further information. After the announcement of the 2nd round result, NIIED will forward the candidates’s documents to the universities as written on the application forms, All applicants must double-check their choice of preferred universities on the application form in order to ensure that their application documents are reviewed by Right and Correct universities. Attention! A candidate who fails to receive admission to any one of the three universities will not be selected as a KGSP scholar. Regarding of university admission, all scholars must achieve the TOPIK level required by NIIED before the completion of the 1st year Korean language program. Any scholar who fails to do so cannot proceed to this or her degree program. For more details of Korean Government Scholarship 2018 – Download Information Brochure.